Two days of Granogue? That could be beyond epic. 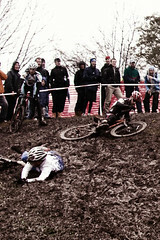 The 2010 MAC Cyclocross schedule offers up some intriguing opportunities and disappointing omissions. On the positive tip, we get an additional day of racing at Charm City and Granogue. Who says you can’t have too much of a good thing? The downer for those of us in and around D.C. is the absence of Capital Cross, our traditional season closer. We hope that this is only a brief hiatus for that race and the Potomac Velo Club boys and girls have us racing at Lake Fairfax in 2011. For the rest of the details on the MAC series rollout, I give you the time-honored journalistic cop-out known as news by press release. Full schedule after the jump. Thanks for reading. April 19, 2010; Conshohocken, PA, USA—It’s that time of year when cyclocross series start announcing their autumn programs. And, as usual, the well-organized MAC Cyclocross on America’s Eastern Seaboard is one of the first to publish a confirmed race schedule; a schedule sees the biggest makeover in many years for the venerable organization. The biggest news on the MAC tour this year is that two of the best-attended races in the east, Granogue and Charm City, have both added a second day of racing to their events this year. They join the season-ending Super Cross Cup in Long Island in offering a two-day UCI experience at a single venue. A full program with all MAC classes will compete each day at each of these two-day events. In other news from MAC’s schedule announcement, the Nittany Lion Cyclocross at the Valley Preferred Cycling Center (a.k.a. T-Town Velodrome) is the new season opener, taking over from Charm City to accommodate Charm City’s expansion to two days. Nittany Lion stands alone as the first UCI-sanctioned cyclocross race in the world this season. And, as the only UCI race anywhere in the world until the following weekend, the winners of the UCI classes at T-Town will be guaranteed a World #1 ranking for at least a week. MAC also welcomes another race this year as the rapidly-growing Whirlybird Cyclocross makes its MAC debut. Held on the beautiful grounds of Pennsylvania’s Bryn Athyn College, the race has proven it’s quality after several years as part of Pennsylvania’s PA Cyclocross Series and now moves up to the big leagues as MAC’s newest addition. Returning this year is the traditional Halloween doubleheader weekend in New Jersey, featuring the HPCX in central New Jersey and the UCI Beacon Cyclocross and its “Amphitheater of Pain” in the southern part of the state. Also returning is another staple of the MAC schedule, the race at the fairgrounds of Maryland’s mountain bike Mecca known as Fair Hill. Altogether, MAC 2010 will see eleven races at eight venues in five states. Eight of those races will be UCI sanctioned. For more information on the MAC, see www.MidAtlanticCross.com. Is it ‘Cross season yet? Any more news on whether there’s a season closer in the DC Area in December ’10, maybe a non-series Capital Cross? That was a tremendous race in ’09 and you guys provided great coverage. Wonder what happened for that race to fall off. Next Next post: Have You Heard About The MABRAcross Logo Contest?